« Warcraft Less Traveled #20 – Elemental Invasion! 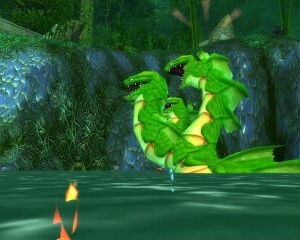 Episode #21 Timecapsule: The monster hydra boss Gahz’ranka hides below the tropical waters of Zul’Gurub. All explorers who take time to increase their fishing skill, can use Nat Pagle’s mudskunk lure to summon this long-forgotten alternate raid boss. This entry was posted	on Tuesday, September 21st, 2010 at 9:20 pm	and is filed under Podcast Episodes. You can follow any responses to this entry through the RSS 2.0 feed. You can leave a response, or trackback from your own site.